The Spitfire represents the pinnacle of inline-piston engined interceptor design, and has become (arguably) THE timeless classic that other aircraft are compared too. Its designer, R.J Mitchell, has become recognized as one of the all time greats in cutting edge aviation design. 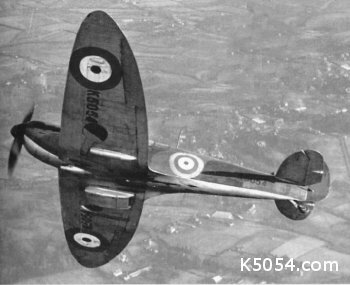 This website is devoted to the Supermarine Spitfire Type 300 Prototype K5054, and the production aircraft that followed her. Spitfire Blooded "Achtung, achtung Schpifeur"
" The Spitfire was a thing of beauty to behold, in the air or on the ground, with the graceful lines of its slim fuselage, its elliptical wing and tailplane. It looked like a fighter, and it certainly proved to be just that in the fullest meaning of the term. It was an aircraft with a personality all of its own -- docile at times, swift and deadly at others -- a fighting machine 'par excellence'. One must really have known the Spitfire in flight to fully understand and appreciate its thoroughbred flying characteristics. It was the finest and, in its days of glory, provided the answer to the fighter pilot's dream -- a perfect combination of all the good qualities required in a truly outstanding fighter aircraft. Once you've flown a Spitfire, it spoils you for all other fighters. Every other aircraft seems imperfect in one way or another. " " Flying the Spitfire was like driving a sports car. It was faster than the old Hurricane much more delicate. You couldn't roll it very fast, but you could make it go up and down much easier. A perfect lady. It wouldn't do anything wrong. The Hurricane would drop a wing if you stalled it coming in, but a Spitfire would come wafting down. You couldn't snap it into a spin. Beautiful to fly, although very stiff on the ailerons - you had to jam your elbow against the side to get the leverage to move them. And so fast!!! If you shut the throttle in a Hurricane you'd come to a grinding halt; in a Spitfire you just go whistling on." K5054 showing off her unmistakeable eleptical wing profile in flight. The prototype Spitfire is distinguishable here by the wheel covers completely covering the wheel-wells, and the original oil cooler. Designed by Supermarine 's brilliant Chief Designer Reginald J. Mitchell the Type 300 Spitfire was a thoroughbred design whose lineage can be traced back through Mitchell's 'S' series of high-speed racing floatplanes of the late 1920's that competed for the 'Coup Schneider' ('Schneider Cup') seaplane contests after the first World War. These popular sea-plane races attracted aviations elite designers and pilots, spurring phenomenal advances in aerodynamic technology and high speed engine development during the years between the two world wars. 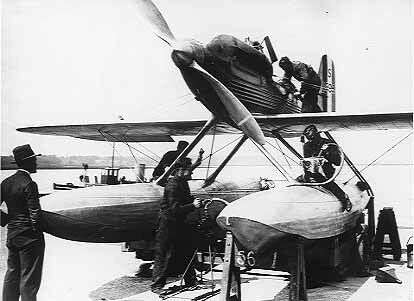 Advanced aerodynamics and airframe engineering were mated to unbridled horse power when Henry Royce developed a special R (R for racing) series of the Rolls Royce Kestrel engine for Mitchell's new S6B seaplane, and the union secured the Schneider Cup for Britain in 1931. The R series trippled the original output of the Kestrel to over 2000 horse power. Mitchell 's Supermarine S6B was one of the major technical achievements in British aviation between the two world wars, and set an absolute speed record of 656 km/h (407.5 mph) on 29 September 1931, alarmingly almost twice the speed of Britains fastest service fighter aircraft at that time ! This Supermarine S6B raised the world absolute speed record to 656 km/h (407.5 mph) in Sept 1931.
the Rolls Royce R Series engine is shown here being lowered into the Supermarine S6B during its construction. The first Supermarine 'Spitfire' (the Type 224 design) first flown in 1934 didnt satisfy expectations. After their success with the the high speed S Series of monoplane racers, Mitchells team thought that designing a fighter to Air Ministry specification F.7/30 would be a relatively simple affair. The design was also hampered by the evaporative cooling design of the 660 horse power Rolls Royce Goshawk engine. The fighter contract was eventually awarded to the Gloster SS 37 (Gladiator) biplane because of it's climb rate advantage over the monoplane designs. In 1934 the Supermarine 224 design was subsequently cleaned up and succesive specifications sought from the air ministry to cover the refinements, eventually leading to the superb Type 300 that followed. The first Supermarine 'Spitfire' - the gull winged Type 224 was not a success, but should be considered a valuable stepping stone to the Type 300 that followed. Note the fixed undercarriage and open cockpit design favoured by most designs of the period. K5054 was the Air Ministry registration given to the (Vickers) Supermarine Type 300 prototype. Construction of K5054 began in Dec 1934 and her maiden flight was on 5 march 1936 at Eastleigh_Aerodrome (later Southampton Airport) piloted by Vickers' chief test pilot Joseph "Mutt" Summers. Minor modifications and refinements were made to the Type 300 as suggested by flight trials over the following months, and K5054 emerged as the pattern for the production version of the now legendary Supermarine Mk.I Spitfire. The final cost of K5054 totalled U+20A4 20,765. The Air Ministry paid U+20A4 12,478 and Rolls Royce paid U+20A4 7,500, leaving Supermarine's final cost for building the Type 300 prototype Spitfire at U+20A4 787. Britain's Air Ministry were so impressed with this new interceptor or 'killer-fighter' that prior to the full test programme being completed, they issued a contract for 310 Spitfires on 3 June 1936. 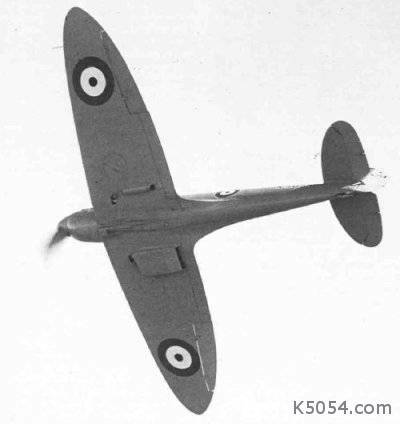 Whilst Mk.I production got underway, K5054 was further refined and modified to become the pattern for the sucessive Mk.II and Mk.III Spitfires. On 22 March 1937, during performance trials at Martlesham Heath, K5054 suffered an oil pressure failure and was damaged during a belly landing, but was repaired. On 4 September 1939 at the Royal Aircraft Establishment at Farnborough, K5054 nosed over on landing and, whilst the fuselage was left intact, the cockpit was crushed. The pilot F/Lt White died of injuries caused by the mast, mounted atop the fuselage behind the pilot, being pushed down through the fuselage and pulling the Sutton seat harness back with such a force that he bent the back of the seat on impact with it (a modification was later made to the run of the cable that anchored the Sutton seat harness to the rear of the fuselage in production aircraft). The accident that destroyed K5054 occurred the very day after Britain declared war on Germany. Spitfires were blooded on a pair of unfortunate Hurricanes of 56 Squadron - shot down by 74 Squadron's Spitfires in a friendly fire incident over the Medway on 6th September 1939. Spitfires shot down their first enemy aircraft when, on the 16th October 1939, Luftwaffe Junker 88s of 1/KG 30, fell to the guns of Squadron Leader Stevens of 603 Squadron, over over the Firth of Forth, Rosyth. By 1940, Spits were fighting in the skies over France and Belgium whilst the allied continental armies crumbled under the well orchestrated german blitzkrieg. In May 1940 the British Expeditionary Force (BEF) having lost most of their equipment in a hasty fighting retreat, fell back on the French port of Dunkirk to await their fate. 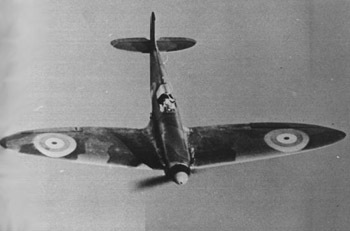 Long-range Spitfire flights from Southern England patrolled the skies approaching the Dunkirk Pocket in an effort to keep the Luftwaffe at bay whilst Britains rescue fleet - a motley flotilla of Royal Navy, merchant marine, and civilian vessels of all vintages and descriptions working under the codename Operation Dynamo, evacuated the remnants of Europe's shattered armies to England, from where it was hoped they might re-group and re-arm to fight another day. By June 1940, Continental Western Europe languished under Hitler, as Britain's newly appointed wartime Prime Minister Winston Churchill shrugged off the shadow of the first world war's failed Dardanelles Campaign, to lead his people in stubborn, arrogant and seemingly futile resistance against the odds. "What General Weygand called the Battle of France is over. I expect that the Battle of Britain is about to begin. Upon this battle depends the survival of Christian civilization. ... The whole fury and might of the enemy must very soon be turned on us. Hitler knows that he will have to break us in this Island or lose the war. ...Let us therefore brace ourselves to our duties, and so bear ourselves that, if the British Empire and its Commonwealth last for a thousand years, men will still say, "This was their finest hour." Hitler readied 160,000 assault troops, Rhine barges, and supporting forces for the invasion of England, codenamed Operation Sealion. For the invasion to succeed, Luftwaffe air supremacy over the landing zones was vital. The RAF was to be either destroyed or pushed back from its coastal bases in Southern England so that the landings could take place. This preliminary operation was to be achieved under the codename Operation Eagle. The British could muster scarcely 3 fully armed divisions in defence of their Isle after the losses in France, so Home Guard units of local defence volunteers aged 17 to 65 were raised - initially armed with pitchforks, shotguns and a handful of rounds each - and were expected to defend against well armed & experienced german shocktroops. The RAF had also been seriously mauled supporting the allied armies on the continent, leaving barely 300 front-line interceptors to defend the kingdom. What aircraft remained was due to the foresight of Air Chief Marshal Sir Hugh Dowding refusing to send any more squadrons to France. The stakes were high - America had yet to enter the war, and if Britain fell, Hitlers secret ambition to conquer Russia would likely succeed. The fate of the world hung in the hands of the young allied pilots. It was said in America that Britain would last no more than 6 weeks before capitulating. Fighter Command pilots flying Spitfire Mk.I's and Hawker Hurricane's (the RAF's other front-line service fighter) found themselves pitted against the cream of Hitler's undefeated Luftwaffe veterans, in a desperate and almost hopeless attempt to maintain air superiority over their vital forward airfields and radar stations. On September 15, during the height of the air battle, Winston Churchill asked his famous question "What other reserves have we?" to which Air Vice-Marshal Park answered "We have none" - Fighter Command had comitted all its reserves to the air battle that day, but the vastly outnumbered Fighter Command pilots gave no quarter, and the tide began to turn. By Autumn 1940 the massed daylight strikes against Britains front line defences had eased - Hitler had been rebuffed for the first time, but a strategic terror campaign known as The Blitz soon followed. Nightly massed aerial bombing of English population centres was hoped to weaken civilian resolve and topple the wartime government, but Hitler had already postponed the invasion of England untill 1941 and re-focused his attention on the upcoming invasion of Russia. The massed aerial battles fought in the skies over the English countryside by The Few in the summer of 1940 had saved Britain from invasion in her Darkest Hour and ultimately turned the tide of the second world war in Europe. The graceful but deadly Spitfire became the symbol of that most important of allied victories. 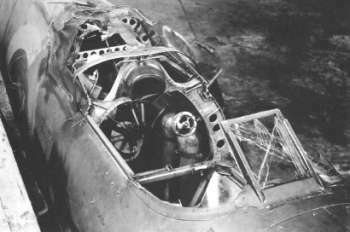 [above] K5054 Prototype Spitfire cockpit showing the original curved windshield that distorted the forward view. It was latter replaced with flat armoured glass. 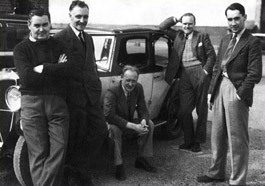 [above] The Vickers-Supermarine team relax around R.J's car at Eastleigh after the maiden flight of Spitfire K5054. [Left to Right:] Captain Joseph 'Mutt' Summers, 'Agony' Payn, R.J. Mitchell, S. Scott Hall & Jeffrey Quill. 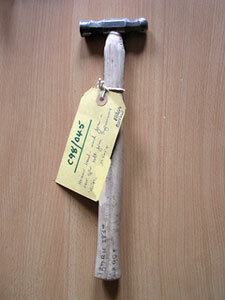 Armament: None initially. Later eight 0.303 in (7.7 mm) Browning machine-guns in wings, with 300 rounds per gun. * Later fitted with Merlin F 1,035 hp (772 kW) and then Merlin II 1,030 hp (768 kW). [above] Rollout Maiden Flight - K5054 at Eastleigh prior to her maiden flight in March 1936 At this stage she had no paint finish except for registration number and RAF roundels. [above] K5054 at Eastleigh - taken around the same time as the photographs above, if not the same day. 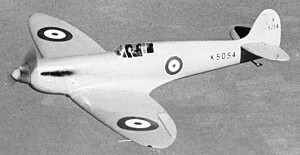 She graced her maiden series of flights as shown with the original 'diagonal' horn balance, flush exhaust stacks, tail skid, flat canopy, but lacked wheel covers and a decent paint finish, The original 2 bladed wooden airscrew was also fitted to the first batch of Spitfire Mk.Is, but they were quickly replaced with 3 bladed variable pitch metal propellors to better absorb engine power. [above] Supermarine Blue - K5054 sporting her famous blue finish and the reduced rudder horn balance. Whilst the flat perspex canopy shown was also fitted to the first batch of Mk.Is, it was later replaced with a perspex bubble canopy that gave tall pilots extra headroom. The curved forward windshield was also later replaced with flat armoured glass. [above] Photographed at the Duxford display 1937. Note the numeral 2 painted on the fueselage. [above] Photographed at Eastleigh Aerodrome(? ), sporting the new flush exhaust fairings designed to produce extra thrust from the new Merlin engine. Along with the extra thrust from the radical new underwing ducted radiator designed by F.W.Meredith, most of the inherent drag usually associated with these 'un-aerodynamic' necessities was cancelled out. [above] Wheels up landing 22 March 1937 during performance trials at Martlesham Heath. The guns are being removed in this photo. K5054 was repaired after this incident. [above] Sporting her last paint finish comprising standard RAF camouflage and mounting 8 machine guns for armament trials. [above] Spitfire prototype K5054 in flight showing off her eliptical wings and standard RAF wartime camouflage. [above] K5054 was destroyed in a fatal crash on 4 September 1939 at the Royal Aircraft Establishment at Farnborough. The cockpit was crushed when the prototype turned over on landing, killing the pilot. Ongoing research and development by Rolls Royce based on experience learnt with the R series of racing engines in the early 30s paved the way for the legendary line of smaller Merlin engines that powered many allied aircraft during WWII, including the Supermarine Spitfire, North American P51 Mustang, Hawker Hurricane, D.H. Mosquito and the Avro Lancaster heavy bomber. The RR Griffon engine was a direct development of the Kestrel - Buzzard - R-Series progression that powered the S6B to fame in 1931, and after 10 years of development the engine finally entered service with the RAF towards the end of the war. Ironically, late model Spitfires powered by these Griffon engines could finally match the speed record set by their predecesor, the S6B in 1931! On the 20th February 1948, almost twelve years from the prototype's first flight, the last production Spitfire, an F Mk 24 (VN496) left the production line. Some 22,759 Spitfire's and Seafire's were built over a 10 year production run during which time Reginald Mitchell's classic design evolved almost beyond recognition into 24 different marks. The Spitfire was the worlds only fighter aircraft in series production before, during, and after the second world war, and served with many of the worlds airforces well into the 1960's! The only 'surviving piece' of K5054 appears to have been a wing bolt that an engineer kept and re-manufactured into a sheet metal workers hammer head. This valuable piece of aviation history is now in the custody of Solent Sky, Southampton, and can be seen on display at the Spitfire Exhibition at the Science Museum in Kensington, London. 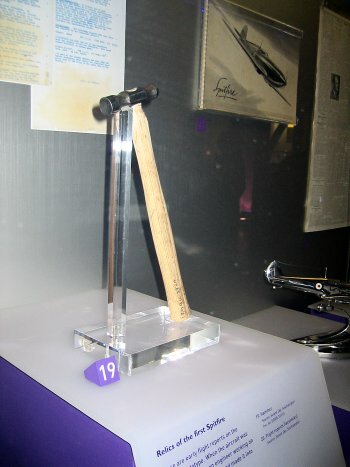 The Solent Sky 'wing bolt Hammer Head' as seen on display at the Spitfire Exhibition - Science Museum in Kensington, London. Alex Henshaw passed away at home on Saturday February 24th 2007 aged 94. He was one of the great aviation pioneers, air race master, and with a record-breaking trip from the UK to Cape Town and back. 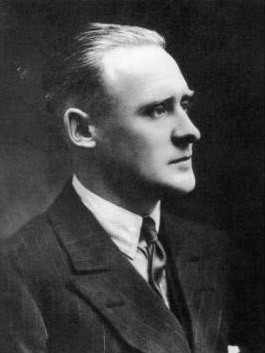 Alex was renowned as the chief test pilot for Vickers-Armstrong at the Castle Bromwich aircraft factory, and a master display pilot of the immortal Spitfire. Henshaw volunteered for service with the RAF during World War II, but instead became a test pilot for Vickers Armstrong. He starting with Wellingtons and Walruses at Weybridge. He did not enjoy the work, and was on the point of leaving when Jeffrey Quill invited him to test Spitfires in Southampton. 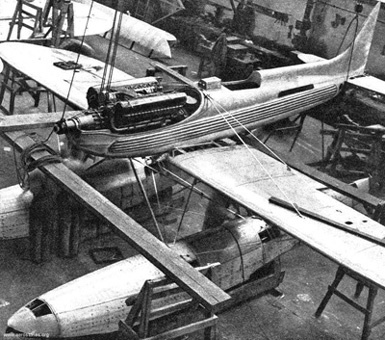 In June 1940, he moved to the Castle Bromwich aeroplane factory in Birmingham, taken over by Vickers after poor production results by the Nuffield group. He was soon chief test pilot. The factory built over half of the total output of Spitfires ever made, and 350 Lancaster heavy bombers. Henshaw tested both, leading team of 25 others. The job was essential, to ensure that faults were detected before aircraft were delivered to the font line, but was also dangerous: two of his team were killed testing new aircraft. Henshaw survived many forced landings, and a catastrophic crash between two houses in Willenhall in July 1942 which destroyed the aircraft. It is estimated that Henshaw flew 10% of all Spitfires and Seafires, testing up to 20 aircraft a day in often foggy conditions. He would also demonstrate the Spitfire to visiting dignitaries, such as Winston Churchill, and once flying the length of Broad Street in Birmingham at low level. He was the only pilot known to perform a barrel roll in a Lancaster bomber, a feat that was considered reckless and impossible due to the aircraft's size and relatively low speed. He was awarded the MBE for his wartime service. 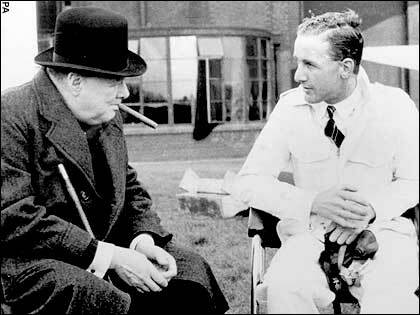 Henshaw chatting with prime minister Winston Churchill about the Spitfire. Potteries historian Ray Johnson talks to BBC Radio Stoke's Janine Machin about the importance of the Spitfire. Here are some BBC news links concerning celebrations to mark the 70th anniversary of K5054 's maiden flight at Eastleigh Aerodrome on 5th March 1936. We are eagerly awaiting the upcoming 75th anniversary in 2011, at what will hopefully be the soon re-named 'RJ Mitchell International Airport'. Official Specifications: F.7/30, F.37/34, F.10/35, F.16/36 etc. My aim is to publish surviving documents, images and personal memories relating to the first Spitfire - K5054. If you have any interesting material concerning K5054 or Spitfires in general please contact me. Please also contact me if I have published an image that you hold copyright over and I will give full credit. Thank you for visiting - please return soon. The contents of this page are © K5054.com 1999-2008. Reproduction of any copyright material from this site without permission is expressly forbidden.